Getting Down to Facts II (GDTF II) is released today! This major PreK-12 education report, produced by leading education policy researchers across the country, reveals that California has made improvements due to recent reforms, but that major system-wide funding challenges and significant gaps in student achievement remain. The findings contained in the report comprise 36 studies and 19 research briefs on the effects of reforms adopted over the past decade in California’s PreK-12 education system. 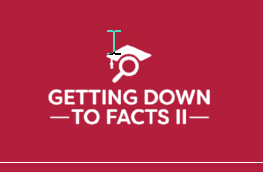 Led by Dr. Susanna Loeb, formerly at Stanford University and now the Director of the Annenberg Institute at Brown University, the GDTF II report is a follow-up to the 2007 Getting Down to Facts report which compelled sweepingchanges to the state’s K-12 system. The four areas of study in GDTF II include student success, governance, funding, and personnel. More than 100 researchers from across the nation examined a variety of reforms including the state’s revamped academic standards, transformed models for education funding and accountability, and localized flexibility in finance and overall student success.